Tarkett has participated in an innovative social housing project in Luxembourg, helping to create a modular apartment block that can be disassembled and rebuilt elsewhere, when it reaches end of life. The three-storey NESTO building in Wiltz comprises six affordable apartments for underprivileged families, and is the first of its kind to be built using circular economy principles. Supporting this collective ‘circular’ endeavour reflects Tarkett’s ambition to ‘Doing Good. Together’, promoting healthy living, preserving natural resources and collaborating with like-minded partners to address sustainability challenges. The building benefits from two environmentally-friendly Tarkett flooring solutions. First of all, the Cradle to Cradle Gold-certified resilient modular flooring solution, iD Revolution, and second of all, mineral-based tile, Cementi Click. NESTO was conceived by renewable energy specialist Heliosmart and engineering consultancy ProGroup. Its name refers to birds’ ability to build nests using only the materials they need from nature, with no waste. In particular, the project has been designed to prioritise residents wellbeing, while respecting natural resources and optimising the total cost of ownership. Anne-Christine Ayed, Tarkett’s EVP Research, Innovation and Environment. To create this urban ‘nest’, the partners sought to source good materials, promote good indoor air quality, achieve a carbon neutral footprint, and prevent any waste (such as unused spaces). Importantly, they ensured that all the elements of the building could be disassembled, repaired, and used to create a new building. Tarkett has contributed to fulfilling these aims firstly by providing two products that are following Cradle to Cradle® principles, products that are designed for life and manufactured in a way that helps to preserve natural resources. Firstly, iD Revolution contributes to good indoor air quality and healthy indoor environment. It has ultra-low VOC emissions (<10 µg / m3 after 28 days), and is 100% free of phthalates, solvents and plasticisers. iD Revolution is a non PVC modular flooring with Cradle to Cradle® gold certification. It is regenerative by design as it is comprised of 83% recycled, mineral and bio-based materials and is 100% recyclable, helping to ease pressure on finite natural resources. Indeed, overall, 71% of the raw materials used to build NESTO were found abundantly in nature, renewable or recyclable. Meanwhile, Cementi Click, Tarkett’s new category of premium mineral tiles and planks is produced from 95% clay, cement’s main composite. Cementi Click has the look and feel of a ceramic floor, but the added advantages of the click system provide the optimal solution for those looking to combine design and raw material with easy installation. Cementi Click’s foam backing layer supports good sound-proofing, helping to improve residents’ wellbeing. Both iD Revolution and Cementi Click are entirely recyclable, supporting the NESTO project’s efforts to close the loop. Both products can once again be re-used at the end-of-life stage. 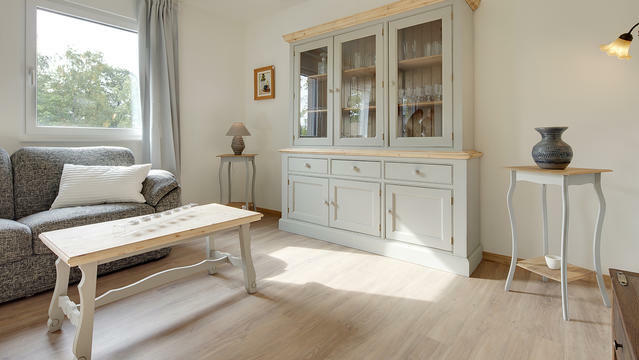 Through ReStart®, Tarkett’s take-back programme, they can be collected and sent back to the manufacturing site to be re-engineered as a new product. This allows to create value from waste and further reduce pressure on natural resources, in line with circular thinking. With the materials assembled into pre-fabricated modules, the partners built NESTO within just a few weeks. The choice of Cementi Click contributed to the rapid construction, simply clicking into place (with minimal preparation of the floor underneath), facilitating installation. Its rigid structure is highly resilient and suitable for areas with heavy footfall, helping to make NESTO economical to run, too. Hardwearing fittings, efficient maintenance and optimal use of space (such as designing out basements and lifts), have all contributed to predicted running cost savings of 60%, compared to conventional apartment blocks. The building’s economic viability is integral to its affordability, enabling the partners to rent NESTO to Luxembourg’s social housing agency (the Agence Immobilière Sociale) at a lower than market rate. Tarkett has been present in Wiltz, a hotspot for circular innovation, since 1961. Its research and innovation centre in the town develops flooring solutions to address evolving environmental and technological challenges. The company employs more than 500 people in Luxembourg, at Wiltz and at its manufacturing facility in Clervaux.